Saturday 29th June 2013 – 10.50pm – Steve Parry. Twenty-four coach passengers had a ‘lucky escape’ according to ambulance crews after their vehicle left the road on the A46 near Combe Fields this evening. A Patient Transport Vehicle from West Midlands Ambulance Service came across the incident and raised the alarm at just after8.30pm. Two ambulances, together with a paramedic officer in a rapid response vehicle were sent to the scene. A West Midlands Ambulance Service spokesman said: “Crews responded to reports of a coach coming off the A46 near Combe Fields. “The group of twenty-four woman passengers were apparently travelling from Yorkshire to Coventry. “Three patients, believed to be in their sixties, were treated for minor injuries. They were conveyed to the University Hospital Coventry and Warwickshire for precautionary assessments. Saturday 29th June 2013 – 10.15pm – Steve Parry. A cyclist has been taken to hospital following a road traffic collision in Brierley Hill tonight. 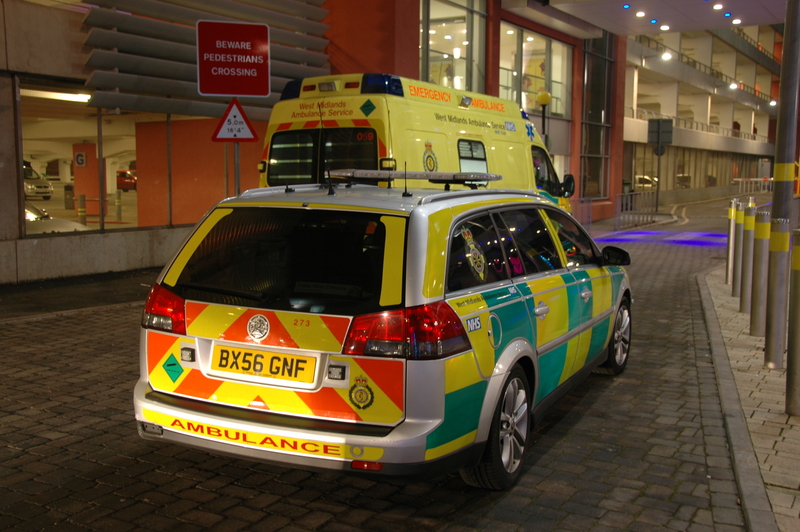 West Midlands Ambulance Service was called to an incident in Moor Street at 8pm. Two ambulances, a paramedic officer and the Medical Emergency Response Incident team (MERIT) attended the scene. A West Midlands Ambulance Service spokesman said: “The ambulance service responded to a collision between a car and cyclist. “Crews treated a male in his thirties for serious head injuries and leg fractures. “The patient was immobilised using a neck collar, spinal board and leg splint. He was anaesthetised by a MERIT doctor and conveyed to the Queen Elizabeth Hospital for further assessment and treatment. Saturday 29th June 2013 – 2.30pm – Steve Parry. A motorcyclist has been taken to hospital following a road traffic collision near Atherstone, earlier today. West Midlands Ambulance Service was called to the incident in Coleshill Road, Bentley at approximately 12.30pm. An ambulance, a paramedic in a rapid response vehicle, together with a paramedic officer and the Warwickshire and Northants Air Ambulance attended the scene. A West Midlands Ambulance Service spokesman said: “The ambulance service responded to a motorcyclist who had come off his machine and hit a tree. “Crews treated a male in his twenties for serious back, neck and head injuries. Friday 28th June 2013 – 8.50pm – Steve Parry. 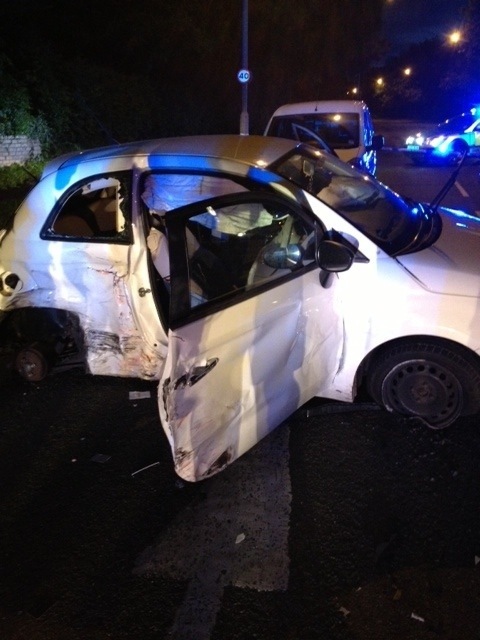 Five men have been taken to hospital following a two car road traffic collision in Smethwick this evening. West Midlands Ambulance Service attended the incident in Soho Close, just before 6pm. Three ambulances, a paramedic in a rapid response vehicle and a paramedic officer were sent to the scene. A West Midlands Ambulance Service spokesman said: “Ambulance crews treated four men from one of the vehicles involved. The patients were all treated for head and neck pain. They were taken to City and Sandwell Hospitals. Thursday 27th June 2013 – 11pm – Steve Parry. 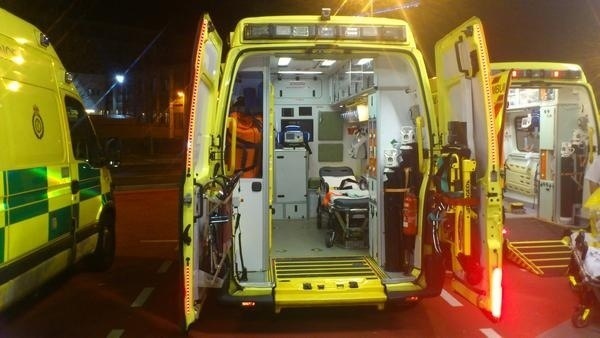 Four people have been taken to hospital following a road traffic incident in Essington, south Staffordshire this evening. West Midlands Ambulance Service was called to Bognop Road just after 8pm. Four ambulances, a paramedic in a rapid response vehicle, a paramedic officer and the Medical Emergency Response Incident Team (MERIT) were sent to the scene. A West Midlands Ambulance Service spokesman said: “Ambulance crews responded to a road traffic collision involving a van and car in Essington. Four patients were taken to hospital by land ambulances. “A woman in her forties was treated for serious leg injuries. The patient was given pain relief, immobilised with the use of splints, neck collar and spinal board before being conveyed to the University Hospital of North Staffordshire. .
“A man in his forties was treated for serious head and chest injuries. He was anaesthetised by a MERIT doctor before being conveyed to the University Hospital of North Staffordshire for further assessment and treatment. “The hospital was alerted to the serious condition of the two patients. Thursday 27th June 2013 – 7.30pm – Steve Parry. Two people have been taken to hospital following a road traffic collision in Kidderminster this afternoon. West Midlands Ambulance Service was called to Habberley Lane, Franche, just after 3.45pm. Two ambulances, a paramedic in a rapid response vehicle, a paramedic officer, together with the Midlands Air Ambulance based at Cosford, were sent to the scene. A West Midlands Ambulance Service spokesman said: “Ambulance crews responded to a road traffic collision involving a car and a 4×4 vehicle. “A woman in her eighties travelling as a passenger in the car was treated for serious chest, neck and arm injuries. 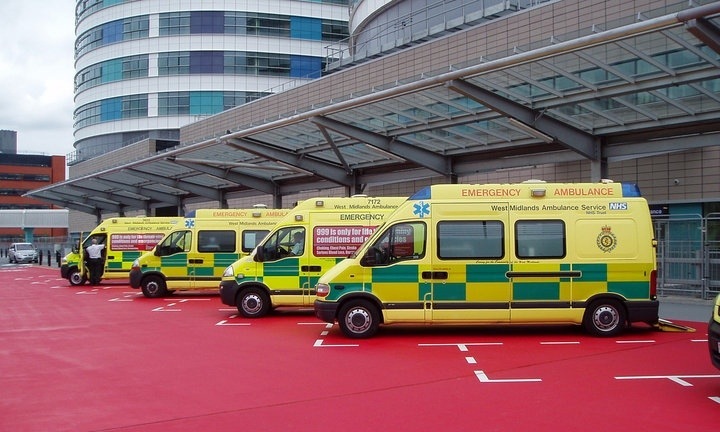 The patient was immobilised with the use of a neck collar and placed on a spinal board before being taken by land ambulance to the Queen Elizabeth Hospital in Birmingham. A doctor from the air ambulance travelled with the patient. “The car driver, a man in his eighties, was treated for back, neck and internal injuries. He was also immobilised before being conveyed to the same hospital by land ambulance. The hospital was alerted to the serious condition of both patients. “The driver of the 4×4 vehicle was assessed at the scene before being released. Thursday 27th June 2013 – 11.50am – Murray MacGregor. Two motorcyclists have been hurt after separate collisions within half an hour of each other in Warwickshire this morning. The first collision happened at the junction of the A429 Fosse Way and the B4035 near Shipston on Stour. An off duty paramedic from South Central Ambulance Service came across the incident and stopped to offer assistance. A land ambulance from West Midlands Ambulance Service was sent after a 999 call at just after 8.30am. On arrival, the crew found a car and a motorcycle had been in collision. The motorcyclist was found about 10 feet from the bike. The rider, a 59 year old, was complaining of neck pain, a bruised right knee and a possible fracture of his right ankle. The rider’s helmet was also damaged. The man was immobilised using a neck collar and spinal board, was given pain relief and had his ankle splinted before being taken to the Major Trauma Centre at University Hospital Coventry & Warwickshire. The car driver was shaken but otherwise uninjured. The second incident happened at the junction of Dale Avenue and Banbury Road in Stratford Upon Avon at just after 9.00am. Again a car and a motorcyclist were involved in a collision. An ambulance and a rapid response vehicle were sent to the scene. The rider, a man in his 20s was found about 10 feet from the crash. He was suffering from hip and pelvic pain and he had a nasty cut to his left knee. The ambulance staff immobilised him, stabilised his pelvis and dressed his wound before taking him to the same hospital. Again, the car driver was uninjured. “I have been riding for over 20 years and have dealt with many accidents involving riders. One of the causes of accidents is drivers failing to see the biker because they are more difficult to spot than a car. Thursday 27th June 2013 – 11.30am – Steve Parry. Two people have been taken to hospital following a road traffic collision on the B4394 at Allscott, between Shrewsbury and Telford. West Midlands Ambulance Service was called to the scene just after 9.40am. An off duty paramedic came across the incident and dealt with the patients until medical assistance arrived. One ambulance, a paramedic in a rapid response vehicle, a paramedic officer together with the Midlands Air Ambulance based at Cosford were sent to the scene. “A man in his twenties was trapped in the car. He was released and treated for serious chest and abdominal injuries together with a fractured arm. 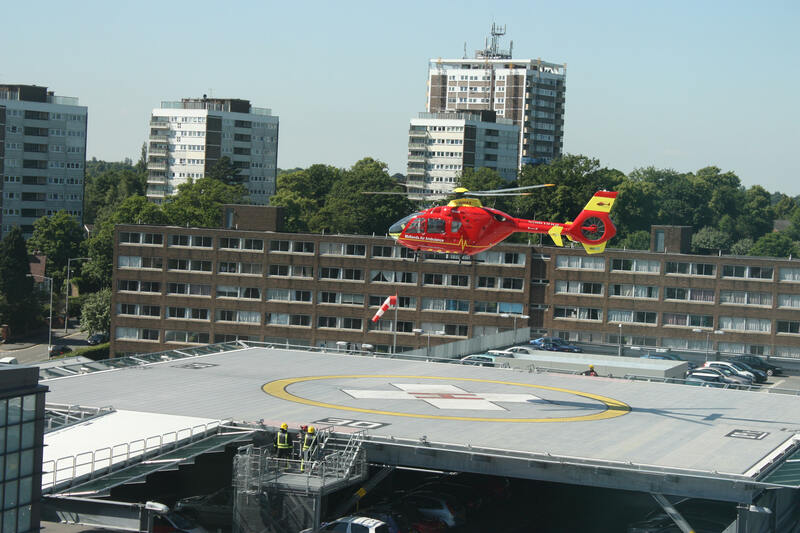 The patient was given pain relief treatment and immobilised with the use of a neck collar and placed on a spinal board before being airlifted to the Queen Elizabeth Hospital in Birmingham. Thursday 27th June 2013 – 8am – Steve Parry. 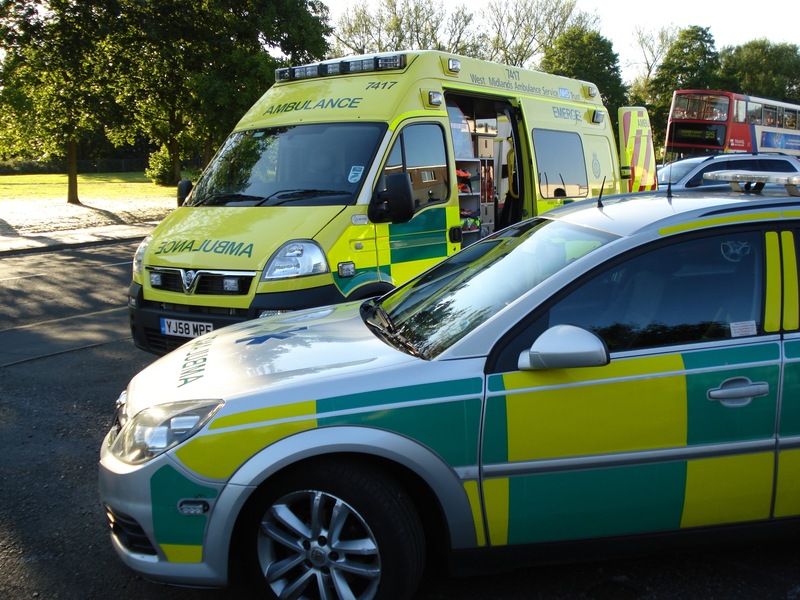 A woman has been taken to hospital following a road traffic collision near Warwick. West Midlands Ambulance Service was called to the incident on The Cumsey, Claverdon, just before 11.20pm (WEDNESDAY). A West Midlands Ambulance Service spokesman said: “Ambulance crews responded to a road traffic collision involving a car that had overturned. “A woman believed to be in her twenties, was trapped for almost an hour. She was later released and treated for pelvic, head and back injuries. Thursday 27th June 2013 – 7.40am – Steve Parry. A woman has died following a road traffic collision on the M40 in Warwickshire. An ambulance, a paramedic officer, a paramedic in a rapid response car and the Medical Emergency Response Incident team (MERIT) were sent to the scene. A West Midlands Ambulance Service spokesman said: “Crews attended a two car road traffic collision on the M40. “Sadly, it quickly became apparent to crews that nothing could be done to save a female. She was confirmed dead at the scene. Wednesday 26th June 2013 – 7pm – Steve Parry. A car driver has been airlifted to hospital following a road traffic collision on the A40 near Ross on Wye this afternoon. West Midlands Ambulance Service was called to the scene just after 3pm. One ambulance together with the Midlands Air Ambulance based at Strensham, were sent to the scene. A West Midlands Ambulance Service spokesman said: “Ambulance crews responded to a road traffic collision involving two cars on the A40 near the Wilton roundabout this afternoon. Wednesday 26th June 2013 – 4.25pm – Chris Kowalik. Volunteers from the charity ‘Herefordshire Heartstart’ will be at Whitney-on-Wye toll bridge on Sunday 14th July. Between 9am and 5pm, the usual toll charge will be removed between, but people crossing the bridge will instead be are asked to make a donation to the charity to support its vital work. Volunteers will also be selling home-made cakes and biscuits on the bridge. Money raised will be used to help ‘Herefordshire Heartstart’ continue teaching emergency lifesaving skills across the county. Wednesday 26th June 2013 – 4pm – Steve Parry. 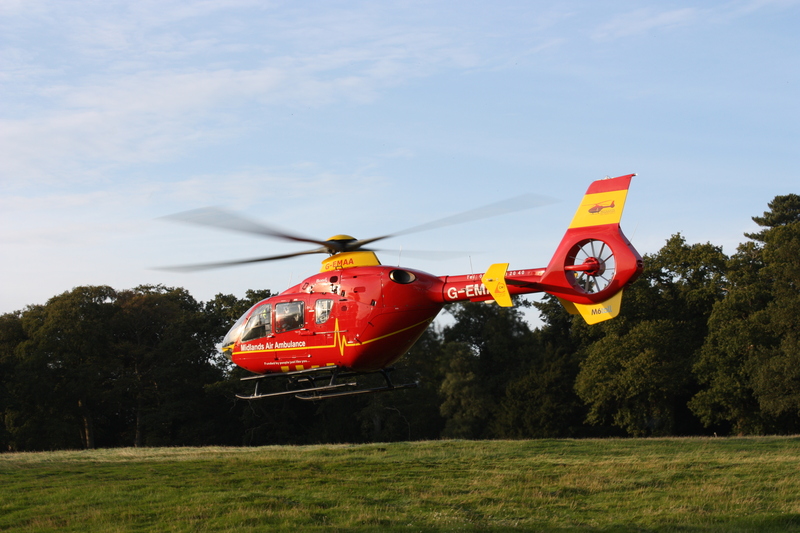 A woman has been taken to hospital after falling from her horse near Coleshill this morning. The incident occurred in Packington Lane, just before 9.50am. The Midlands Air Ambulance from Tatenhill and a paramedic in a rapid response car attended the scene. A West Midlands Ambulance Service spokesman said: “Crews arrived to find a woman had fallen from a horse. “A woman in her forties was treated for a serious head injury. Wednesday 26th June 2013 – 1.30pm – Suzie Fothergill. 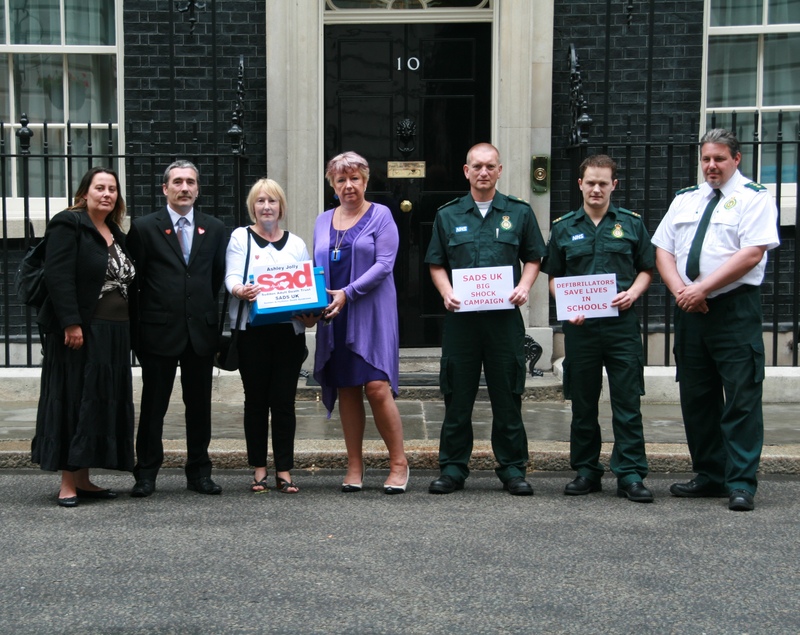 A representative from West Midlands Ambulance Service recently visited Downing Street to support cardiac charity SADS UK in delivering a petition as part of their ‘The Big Shock Campaign’. On Thursday 20th June, WMAS Community Response Manager, Matt Heward joined Anne and John Jolly, the founders of SADS UK, Redditch MP Karen Lumley and representatives from London Ambulance Service to deliver an 8,000 signature petition to the Prime Minister’s Office, urging the Government to bring in legislation making defibrillators mandatory in all schools. With an estimated 270 cardiac arrests occurring in UK schools each year SADS UK felt compelled to launch ‘The Big Shock Campaign’, which is a nationwide initiative to make defibrillators available on all school premises. Talking about the campaign, Anne Jolly, founder of SADS UK said: “It is likely that children with undiagnosed heart conditions exist within the school population and sadly cardiac arrests may happen at any time. The charity knows only too well the heartache of parents who contact the charity after the sudden death of a child. “Applying a defibrillator as soon as possible when a person goes into cardiac arrest gives them best chance of surviving. In support of the campaign Matt Heward, WMAS Community Response Manager said: “West Midlands Ambulance Service fully supports SADS UK with their Big Shock Campaign. 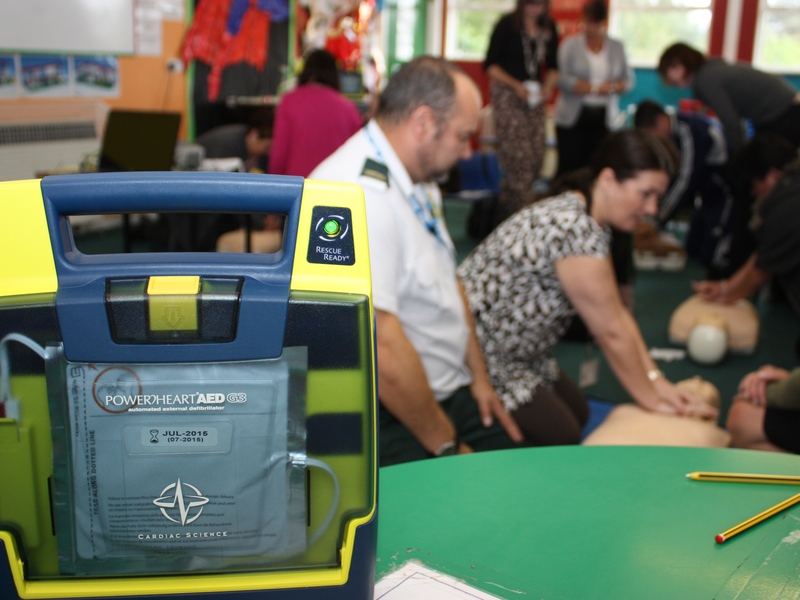 As a service we strongly believe that by having defibrillators installed in public places, such as schools, and by having people trained in their use, helps to ensure that the best care possible can be provided quickly and effectively, should anyone ever unfortunately suffer a cardiac arrest. “The quicker someone is defibrillated, not only improves the chance of their survival, but it can also help to improve the chances of a patient’s full recovery and reduce the time to do so. For every minute a patient is in cardiac arrest, their chance of survival decreases by 10 percent. For further information about ‘The Big Shock Campaign’ please contact Anne Jolly on 01277 811215, email: info@sadsuk.org or visit http://www.sadsuk.org. Pictured from left to right: SADS UK West Midlands Representatives, Margaret Underwood and Robert Underwood , Anne Jolly, Founder of SADS UK, Karen Lumley MP for Redditch, Martin Bullock and Malcolm Ritchie from London Ambulance Service and Matthew Heward from West Midlands Ambulance Service. Interested in your ambulance service? Why not join us at our Trust Board meeting at 2pm at the Council House, Malvern District Council. Tuesday 25th June 2013 – 8.55am – Chris Kowalik. Rob Nichols from Evesham recently reached a milestone. After five years as a Community First Responder, he had attended his one thousandth incident. 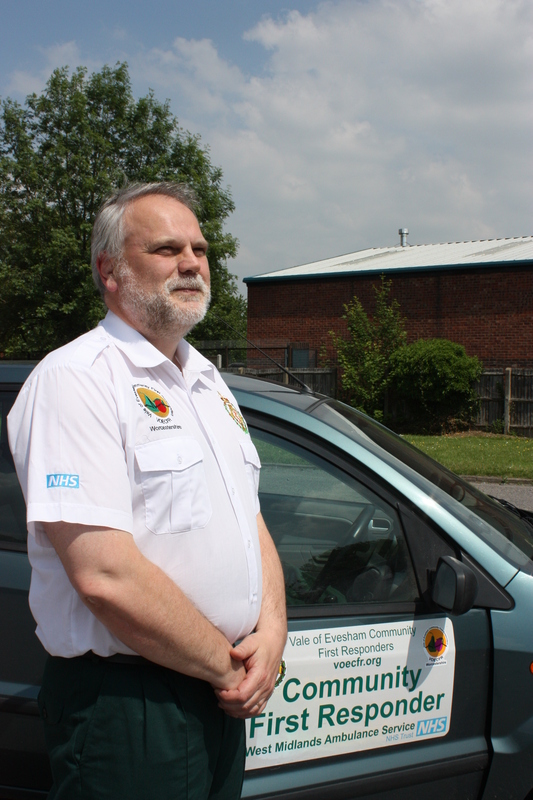 To become a Community First Responder, Rob was trained by the ambulance service. Following his qualification as a CFR, Rob (a member of Vale of Evesham Community First Responders) can be called by the ambulance service’s control room to a medical emergency near him while an emergency ambulance service vehicle is en-route. He puts himself ‘on call’ for the service for approx. 20 hours a week around his full-time work as a web developer and other volunteering work at British Red Cross and St. Richard’s Hospice. The 49 year old CFR’s career began five years ago. He explained: “It was the floods of 2007. I had just finished my training, I hadn’t gone ‘live’ when the floods happened. At the time I was working in Bromyard but only got as far as the floods in Worcester. Rob has dealt with a wide variety of cases including cardiac arrests (involving the delivery of CPR), strokes, and treating unwell children. 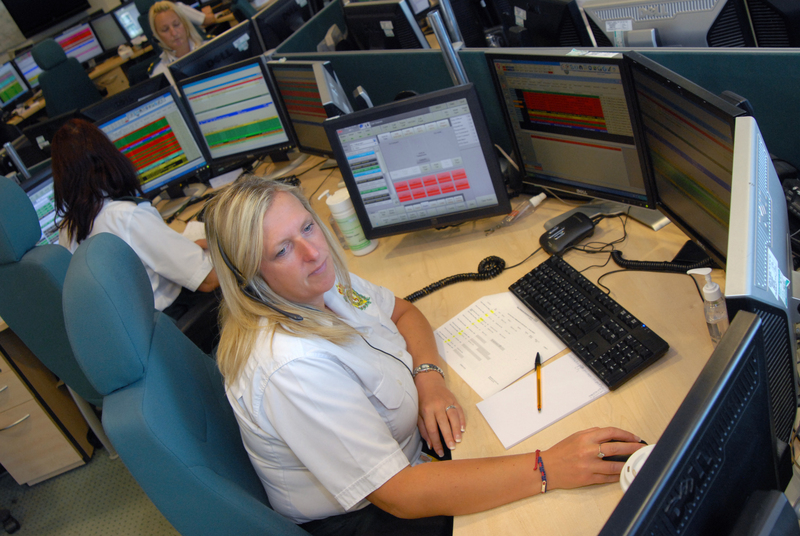 He said “CFRs are often the first members of the Ambulance Service to arrive on scene. We need to cope with being thrown into a situation and must be able to deal with it until the ambulance crew arrive. They then take over the treatment before passing the patient onto the hospital. Rob has also had to deal with cases that are not just traumatic for the patient and their loved ones but for him too, including deaths: “You are going to see some of the worst aspects, but it opens your eyes to things you may have avoided in the past – things you will have to deal with yourself at some point in your life. 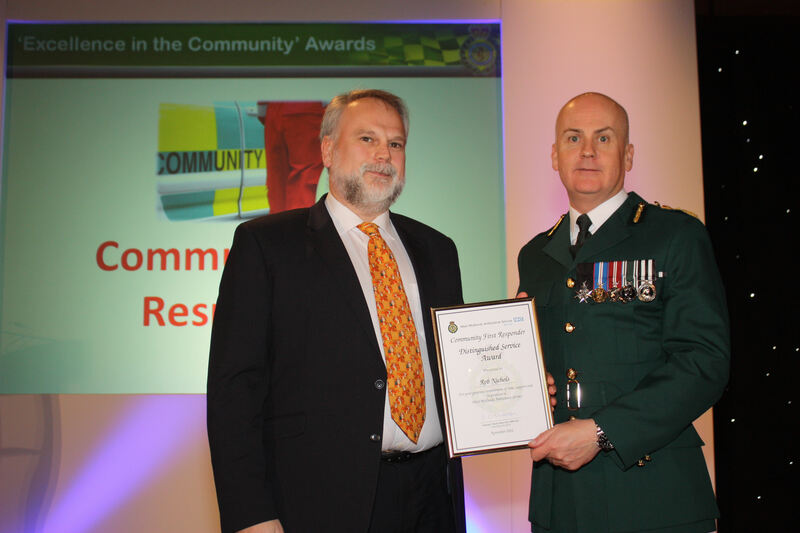 In November 2011, Rob was presented with a “Distinguished Service Award” by the Chief Executive of West Midlands Ambulance Service in recognition of his attending 800 incidents. Rob said he couldn’t have done it without all the help and support he had received, also from St. Richard’s Hospice, British Red Cross, his fellow volunteers at Vale of Evesham Community First Responders and his “long-suffering” wife of whom he said: “I think she is proud of me and glad that I do something I find so rewarding. Tuesday 25th June 2013 – 8.40pm – Murray MacGregor. One woman has died and a man has been seriously injured after a two vehicle crash in Birmingham. They were among six people involved in the collision. The crash happened just after a corner near Bellingham Court on Gravelly Hill in Erdington, close to the A38M. Four ambulances, a paramedic officer and the MERIT Trauma Doctor were sent to the scene after a number of 999 calls at 1.20am on Tuesday morning. A West Midlands Ambulance Service spokesman said: “On arrival, crews found a car that had been in collision with a van with a cherry picker on the back. “The car had suffered very serious damage to the passenger side. “There were five people in the car, all estimated to be in their 20s; two men in the front and three women in the back. “One of the women suffered multiple injuries. The doctor worked on her at the scene before she was taken on blue lights to the Major Trauma Centre at the Queen Elizabeth Hospital Birmingham. “Sadly, despite all of the efforts of ambulance and hospital staff, she died shortly after arrival. “The man in the front passenger seat suffered serious head and internal injuries. He was also taken to the Major Trauma Centre and was taken to for surgery soon afterwards. “The other two women suffered head and leg injuries and were taken to City Hospital. Their conditions were not serious. The driver of the car was uninjured and was also discharged at the scene. 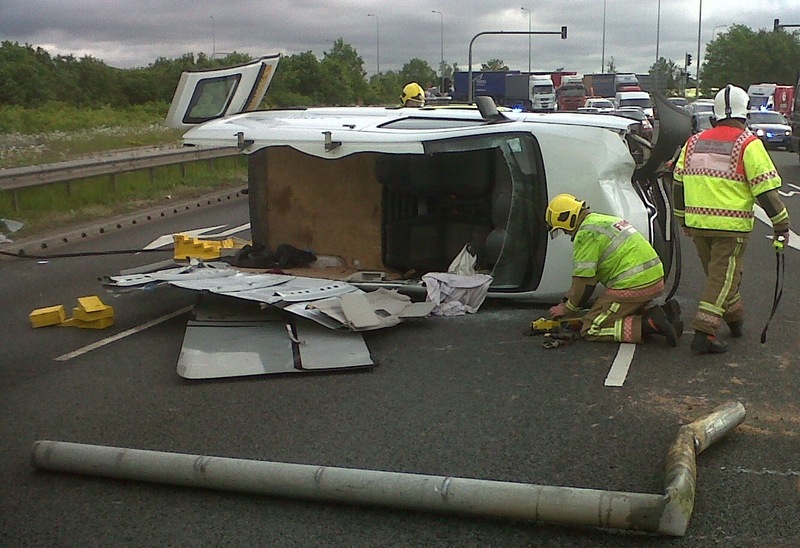 “The driver of the van was assessed at the scene but was uninjured and was discharged. Monday 24th June 2013 – 9.05pm – Murray MacGregor. Two teenage boys have been injured, one potentially seriously, after they were in collision with a car in Nuneaton. Two ambulances were sent to the junction of Queen Elizabeth Road and Dale End after a number of 999 calls at around 6.30pm on Monday evening. A West Midlands Ambulance Service spokesman said: “On arrival, crews found a car that had had a side impact and a motorbike that was badly damaged. “The rider had suffered possible fractures to his pelvis, leg and right arm. He was treated at the scene by ambulance staff to stabilise his condition. He was immobilised and had his injuries splinted before he was taken on blue lights to University Hospital Coventry & Warwickshire. “The pillion passenger had minor injuries but he was taken to the same hospital as a precaution due to the mechanism of the crash. “The lady who was driving the car was unhurt but was understandably shaken by the incident. After assessment, she was discharged at the scene. Monday 24th June 2013 – 10.40am – Chris Kowalik. Volunteer lifesavers in Shropshire have taken delivery of their second four-wheel drive response vehicle to help them get to medical emergencies in their area. 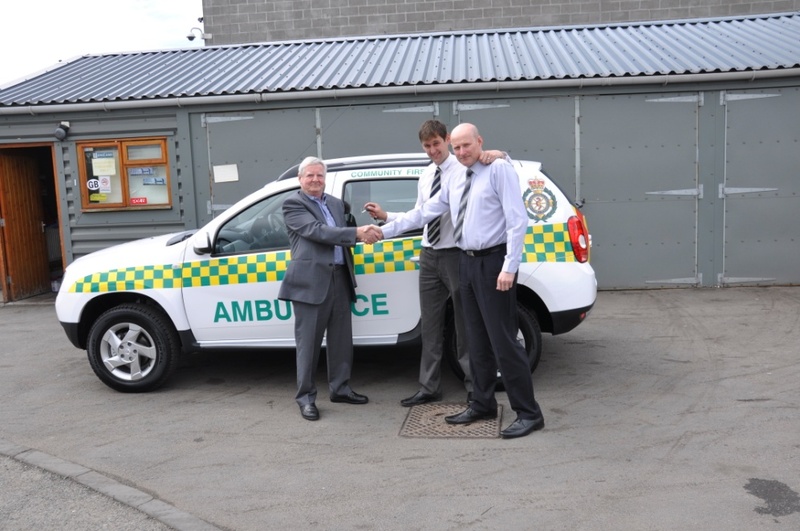 Bishop’s Castle & Clun Valley Community First Responders bought the ‘Darcia Duster’ Laureate dCi 110 four wheel drive vehicle for use in the Clun, Newcastle and surrounding areas. It was made possible through sponsorships from a number of local parish councils, Shropshire County Council Local Joint Committee 19 and The National Lottery ‘Awards for All’ programme and support from William A Lewis of Shrewsbury. Community First Responders are members of the public who have been trained by West Midlands Ambulance Service to a nationally recognised level and provide lifesaving treatment to people in their local communities. They provide vital aid quickly to those living in remote rural locations, prior to the arrival of an emergency ambulance service vehicle. For more information about the work of Community First Responders, visit www.wmas.nhs.uk and find the ‘CFR’ page under ‘About us’. Sunday 23rd June 2013 – 11.40pm – John Hawker. West Midlands Ambulance Service can confirm it was called to reports of a serious RTC on the A442, between Alveley and Kidderminster at around 5.10pm. An ambulance, a rapid response vehicle, a paramedic officer, the West Midlands CARE Team and the Midlands Air Ambulance from Cosford attended the scene. “The passenger in the car, a man, was in cardiac arrest and the driver, a woman was unconscious. “Ambulance crews immediately started emergency treatment, but unfortunately, despite the best efforts of medics, nothing could be done to save the man and he was confirmed dead at the scene. “The woman, believed to be around 70 years old, suffered multiple serious injuries and received emergency treatment at the scene. She was anaesthetised by the Doctor and airlifted to Queen Elizabeth Hospital Birmingham Major Trauma Unit for further treatment. Sunday 23rd June 2013 – 5.00pm – John Hawker. Swimmers at a fitness centre in Birmingham had a lucky escape this morning after a ceiling collapsed into the swimming pool. West Midlands Ambulance Service was called to LA Fitness, Gravelly Lane, Erdington at around 9.55am to reports of the ceiling collapse. An ambulance, a rapid response vehicle, a paramedic officer and the Trusts Hazardous Area Response Team attended the scene. 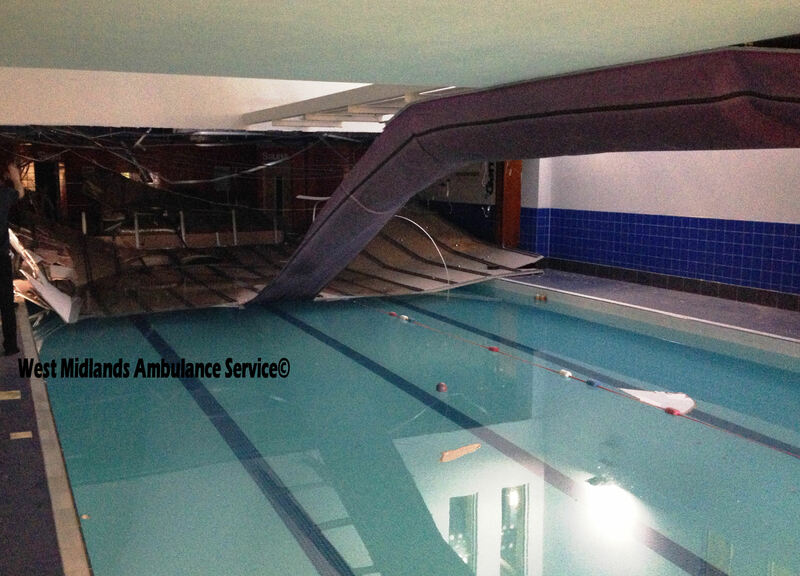 West Midlands Ambulance Service spokesman, John Hawker, said: “Ambulance crews arrived to find a large section of the ceiling that had collapsed directly into the swimming pool. “Four people who were in the pool at the time suffered multiple minor injuries and were being cared for by staff from the fitness centre. The staff had evacuated the area and lead people to a safe part of the building. “Three women and a man, all aged between 30 and 60, received emergency treatment at the scene by ambulance crews, including a patient who suffered a laceration to their head. “After treatment, all four patients were discharged at the scene and did not require further treatment at hospital. 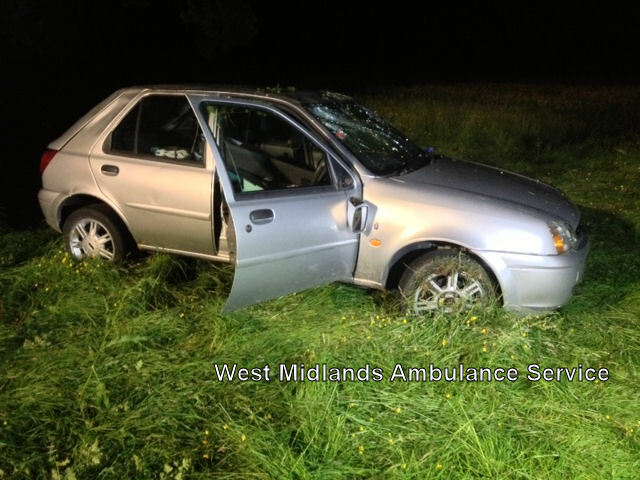 The photo can be used by the media but MUST be credited to West Midlands Ambulance Service. Saturday 22nd June 2013 – 7.50am – John Hawker. West Midlands Ambulance Service can confirm it was called to a serious RTC in Shenley Lane, Northfield at around 2.20am this morning. Two ambulances, a rapid response vehicle, and the Trusts MERIT team attended the scene. A West Midlands Ambulance Service spokesman said: “Crews arrived to find a car that had left the road and been in collision with a tree. The car had also rolled over. “The two occupants of the vehicle, a man and a woman, were trapped due to their injuries. “The man believed to be in his late 20’s, and the woman, believed to be in her 30’s, both suffered serious leg injuries. The woman also suffered pelvic and wrist injuries. “Both patients received emergency treatment whilst trapped in the vehicle, and were then extricated with the assistance of the fire service. They were trapped for around one hour. Saturday 22nd June 2013 – 7.30am – John Hawker. Two men have been injured following a serious RTC in the early hours of this morning in Stoke on Trent. The crash occurred near the junction of Elgin Street and Stoke Road, Hanley at around 5.35am. Two ambulances and a paramedic officer attended the scene. A West Midlands Ambulance Service spokesman said: “Ambulance crews arrived to find a car that had left the road and been in collision with a lamppost, street signs and also a chemist shop. “The car was on fire and the first ambulance crew on scene pulled the two men clear from their vehicle and away from immediate danger. “The driver of the car, a man believed to be in his late 30’s, suffered serious facial injuries and received emergency treatment at the scene. The man was immobilised using a spinal board and neck collar and was transferred by ambulance to University Hospital North Staffordshire for further emergency treatment. “The passenger, a man in his 60’s, suffered chest injuries and was also treated at the scene. He was also transferred to the same hospital for further emergency treatment. Friday 21st June 2013 – 6.45am – John Hawker. 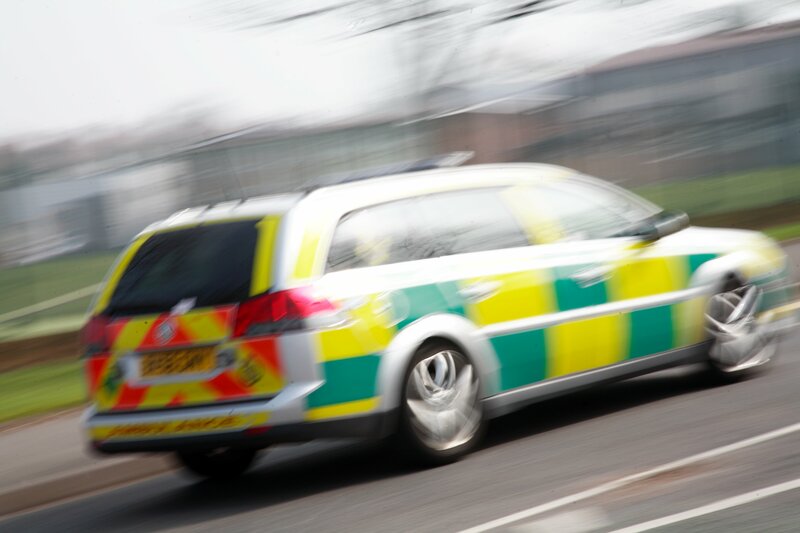 A man has died following an RTC in Solihull last night. 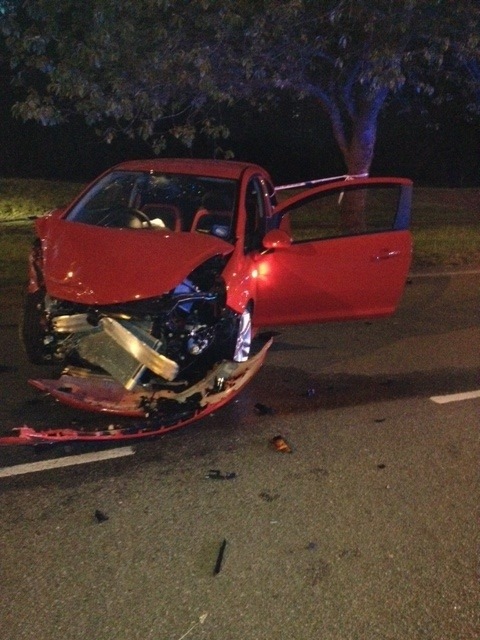 The crash occurred on Kineton Lane, Hockley Heath at around 9.30pm. An ambulance, a paramedic officer and the Trusts MERIT Team attended the scene. 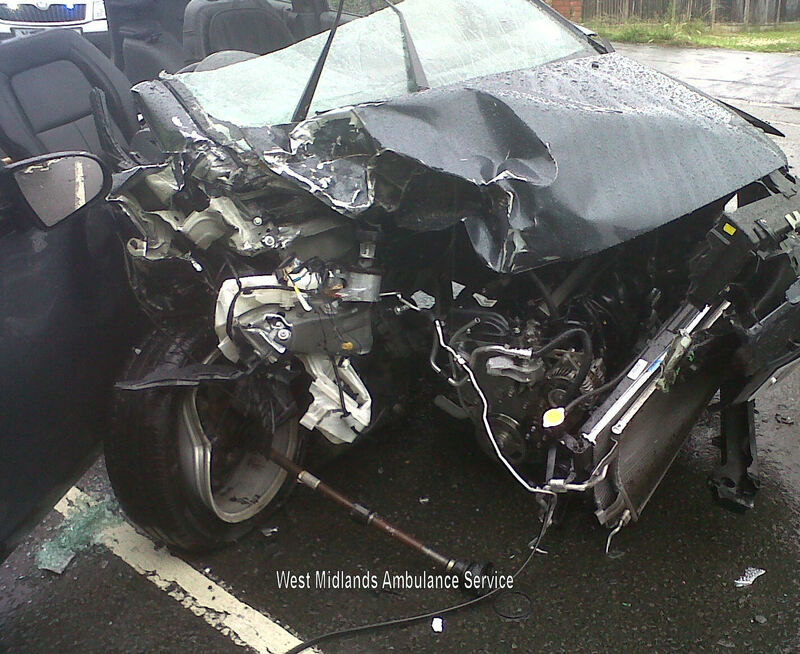 A West Midlands Ambulance Service spokesman said: “Crews arrived to find a car that had been in a serious crash. Issued in conjunction with Worcestershire Acute Hospitals NHS Trust. Thursday 20th June 2013 – 9.40am – Chris Kowalik. Let emergency staff know exactly who to contact if you are in an emergency just by using ICE (In Case of Emergency). Typically ICE is typed in front of a loved one’s name on your mobile phone, to let the emergency services know who to contact in case you are in an emergency situation. However Worcestershire Acute Hospitals NHS Trust and West Midlands Ambulance Service are now urging everyone to carry an ICE contact in an easy to find location. Increased security has led to nearly every phone being locked with a secure passcode, meaning the emergency services cannot access this vital information. By writing the number on a card in your wallet, or sticking it on the back of your phone, it can still be found and used quickly by response teams. Clare Bush, Senior Emergency Ward Sister at Worcestershire Acute Hospitals NHS Trust said: “When an unconscious patient arrives in the A&E department there are many methods we use to identify them and then contact relatives. 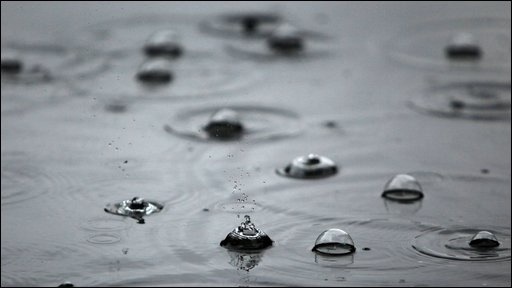 Thursday 20th June 2013 – 9.30am – Claire Brown. A Birmingham school, where a young boy suffered a cardiac arrest on his way home last year, has been given the gift of life. 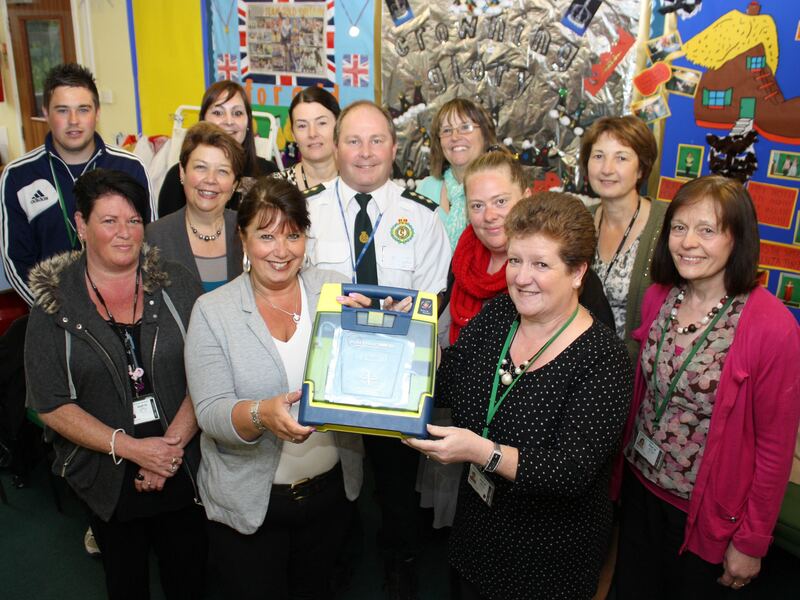 Greenholm Primary School in Great Barr is now home to an automated external defibrillator thanks to West Midlands Ambulance Service. 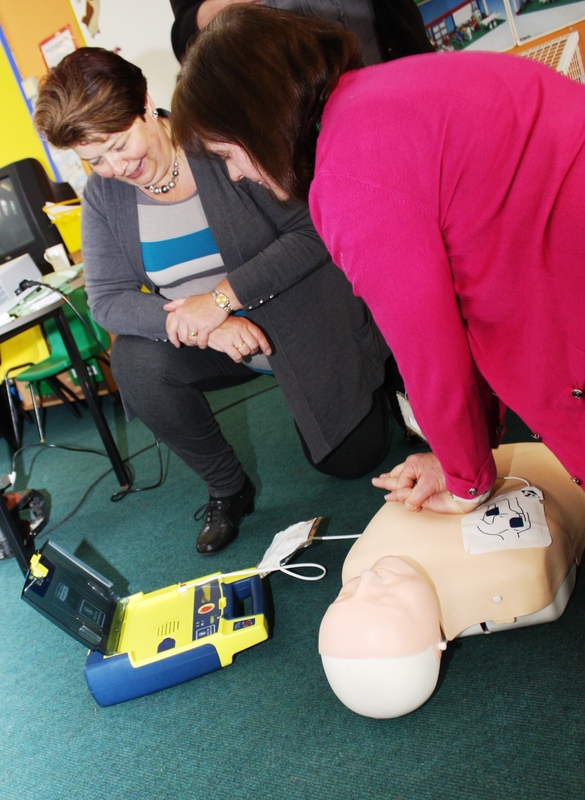 On Friday, eleven teaching assistants went back to the classroom to learn basic life support and the use of a defibrillator; a device used to restart someone’s heart when they’re suffering a cardiac arrest. The new piece of kit comes after seven year old pupil, Callum Bryan, suffered a cardiac arrest as he was leaving school during a thunderstorm last May. Fortunately, thanks to the quick thinking of his mother Jayne, his sister Nicole, ambulance crews and Birmingham Children’s Hospital, Callum returned to school in November after undergoing heart surgery. Clare Russell-Mayne, Teaching Assistant, remembers comforting Callum before home time that day as he was frightened of the thunderstorm. Clare received training last week alongside colleagues and said: “In a previous job, I worked at another school where a child sadly died and always think back to whether the outcome would’ve been different if there had been a defibrillator. Photograph 1 (group): Andy Jeynes (WMAS Community Response Manager) with Teaching Assistants Gail Jackson, Judith Dean, Lynda Mayo, Sylvia Donnelly, Johanna Mack, Janet Lloyd, Sean Broadhurst, Linda Brandon, Nusrat Yaseen, Yvonne Cooksey and Clare Russell-Mayne. Photograph 2 and 3: Teaching assistants practicing CPR. Thursday 20th June 2013 – 9.10am – Chris Kowalik. Two members of West Midlands Ambulance Service staff have embarked on a programme to visit children at schools throughout Shropshire. 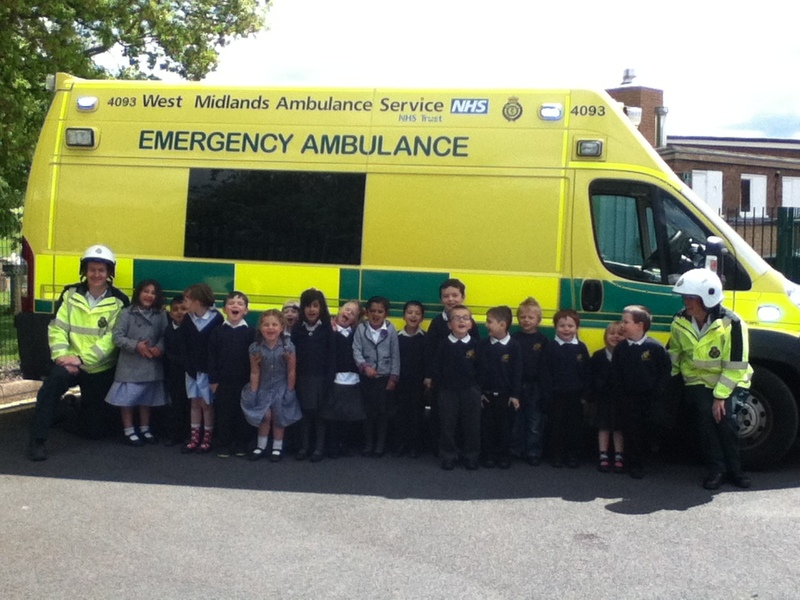 Paramedic Edd Davis and Clinical Team Mentor Tess Allmark’s first trip was to Wrekin View Primary School on Thursday May 23rd. 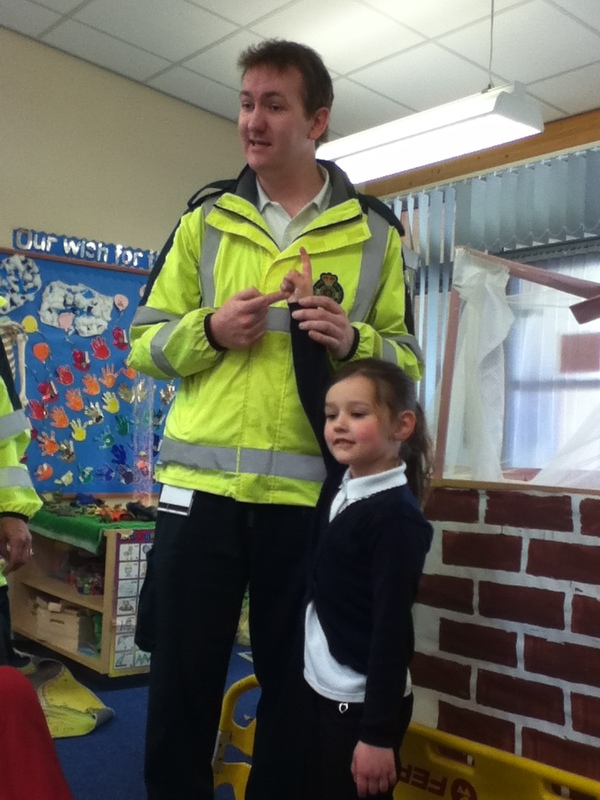 It was also part of the school’s “people who help us” week. 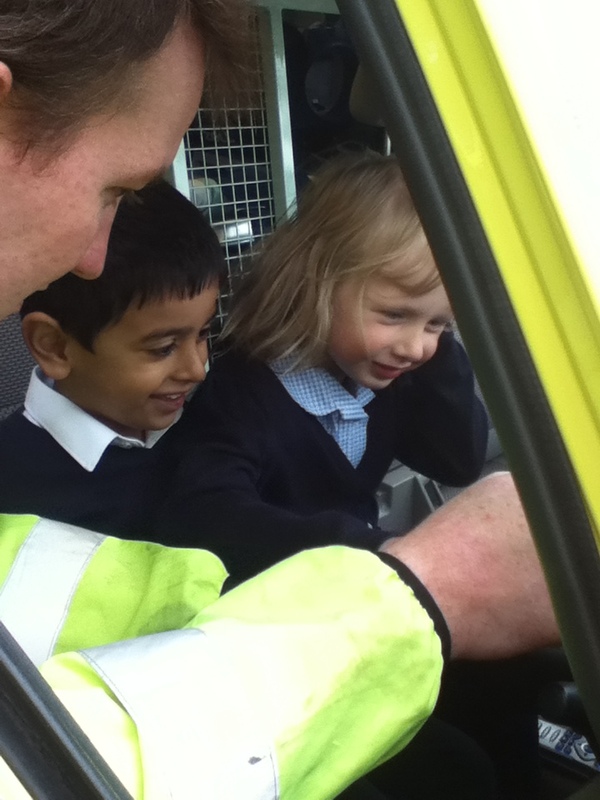 There, they taught children the importance of when to call 999 as well as showing them how to do first aid and dress wounds. Some pupils also played “patients”, being placed on scoop stretchers and having neck collars applied. They were also wowed by the lights and sirens of the ambulance. Wednesday 19th June – 5.30pm – Suzie Fothergill. Volunteers from the Burntwood and District Community First Responders recently joined forces with members of the Girls Venture Corps Air Cadets to carry out a supermarket bag pack in a bid to raise money to help the local community. Community First Responders (CFRs) are groups of volunteers that respond to medical emergencies in rural communities on behalf of West Midlands Ambulance Service, prior to the arrival of an ambulance. In many illnesses or injuries the first few minutes are critical and simple interventions can be performed in order to save lives or prevent disability. These CFR groups are entirely self-funded, so often volunteers will not only be seen attending medical emergencies but they can often be seen out in the local community fundraising and raising awareness of their scheme. The Burntwood and District CFRs have now been responding for a year and a half and currently have three active responders. Talking about the fundraising event, Burntwood & District Community First Responder, Eddie Malpass said: “I would like to say a big thank you to the members from the Girls Venture Corps Air Cadets – Hednesford Unit for their outstanding effort during the day. The team managed to raise over £400 which will help with the fuel and maintenance costs to keep our response vehicle on the road. 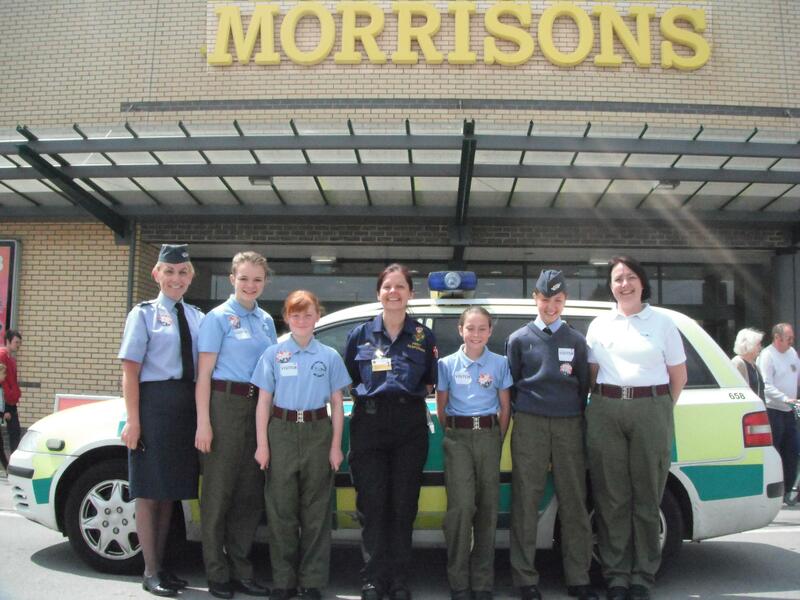 Pictured: CFR group coordinator Vicky Cahill and volunteers from the Girls Venture Corps Air Cadets – Hednesford Unit. Tuesday 18th June 2013 – 6.50am – Murray MacGregor. Five people have been taken to hospital after a two car crash in Stoke on Trent that left both vehicles with massive damage. The collision happened at the junction of Grindley Lane and Farnborough Drive, in Blyth Bridge at about 10.00pm last night, Monday. A community first responder was first on scene and was backed up by three ambulances, two BASICS doctors and a paramedic officer. A West Midlands Ambulance Service spokesman said: “Both cars had suffered very considerable damage. “A woman in her 20s who was the driver of the white car was ejected. She had multiple abrasions and was complaining of chest pains. She was immobilised using a neck collar and spinal board. “A man of a similar age, who was a front seat passenger had shoulder pain and travelled to University Hospital North Staffordshire with the woman. “There were three people in the red car all believed to be in their 20s. The man driving was complaining of chest, abdominal and neck pain. He was also feeling dizzy. He was immobilised at the scene. Monday 17th June 2013 – 5.00pm – John Hawker. Two people have been injured after falling from a scooter in Warwickshire this morning. The crash occurred on Darlingscote Road, Shipston On Stour at around 11.00am. An ambulance, a rapid response vehicle, a paramedic officer and the Warwickshire and Northamptonshire Air Ambulance attended the scene. A West Midlands Ambulance Service spokesman said: “Crews arrived to two people that had been injured after falling from a scooter. “The rider, a 57 year old man, suffered rib and chest injuries in the crash and received emergency treatment at the scene. He was immobilised using a spinal board and neck collar and transferred by land ambulance to University Hospital Coventry and Warwickshire for further treatment. “A 16 year old boy, who was a pillion passenger on the scooter suffered multiple minor injuries and was also treated at the scene. The boy was transferred in the same ambulance to hospital for further treatment. Sunday 16th June 2013 – 10.00pm – Suzie Fothergill. Two men have been taken to hospital following an incident Wednesbury today. West Midlands Ambulance Service was called to a dirt track off St. Pauls Road in Wednesbury shortly after 6.15pm this evening. Four ambulances, a paramedic area support officer, the Trust’s MERIT rapid response vehicle, carrying a critical care paramedic and a trauma doctor and two Midlands Air Ambulances; one from Cosford and one from Staffordshire were dispatched to the scene. A West Midlands Ambulance Service spokeswoman said: “Crews were called to reports of two motorcyclists that had been in collision. “The first motorcyclist, a man, was treated for serious injuries to his head and multiple fractures to his body. Due to the nature of his injuries the doctor from the air ambulance gave the man an anaesthetic at the scene. The man was fully immobilised and airlifted to the major trauma centre at the Queen Elizabeth Hospital Birmingham. “The second motorcyclist, also a man, was treated for serious multiple injuries and suspected internal injuries. The man was given pain relief and fully immobilised at the scene before being conveyed, via land ambulance, to the same hospital for further assessment and specialist treatment. The doctor and the critical care paramedic from MERIT travelled on board the ambulance continuing to provide emergency medical treatment whilst en route to hospital. 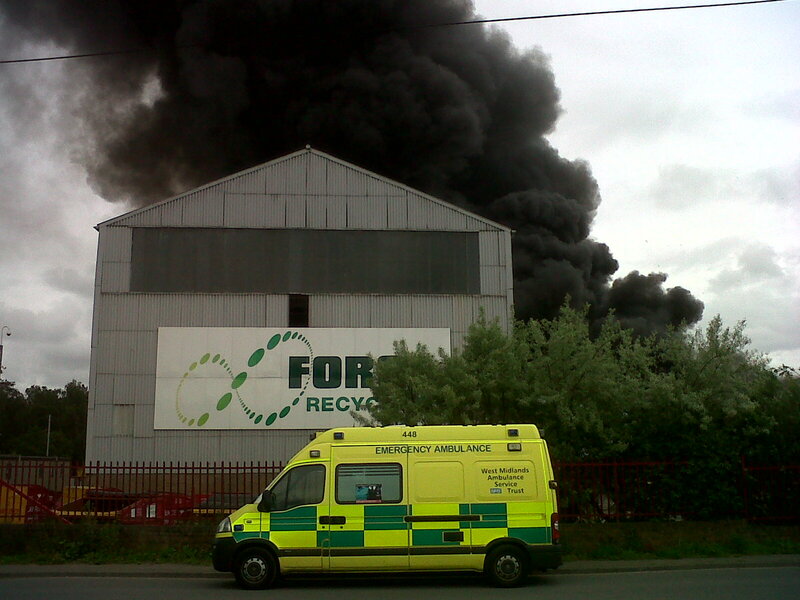 WMAS crews are supporting the fire service at a large fire at a recycling plant in Kidderminster. Road clousures are currently in place around the Vale Industrial Estate. 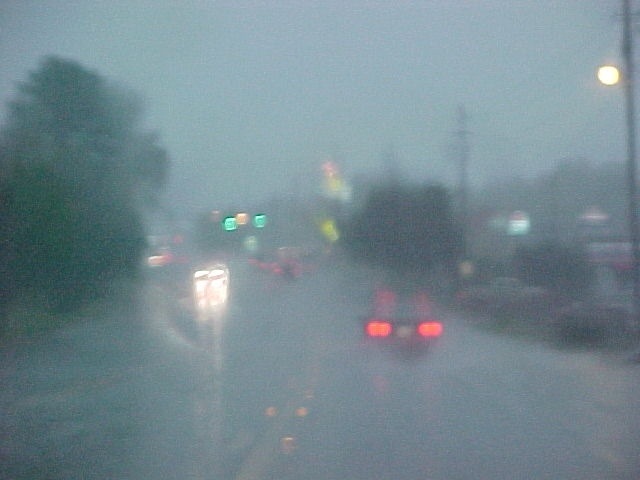 Those living nearby are being advised to keep their windows and door closed. Saturday 15th June 2013 – 5.30pm – Suzie Fothergill. A man has been airlifted to hospital following a road traffic collision in the Black Country today. West Midlands Ambulance Service was called to the junction of Avenue Road and Stourbridge Road in Dudley shortly before 10.40am this morning. An ambulance, a paramedic area support officer and the Midlands Air Ambulance from Cosford were dispatched to the scene. “On arrival at the scene crews treated the motorcyclist for significant multiple limb injuries. The man believed to be in his 50’s was given pain relief at the scene and fully immobilised before being airlifted to the major trauma centre at Queen Elizabeth Hospital for further assessment and treatment. Friday 14th June 2013 – 8.20pm – Suzie Fothergill. Two people have been injured following a road traffic collision in Worcestershire today. 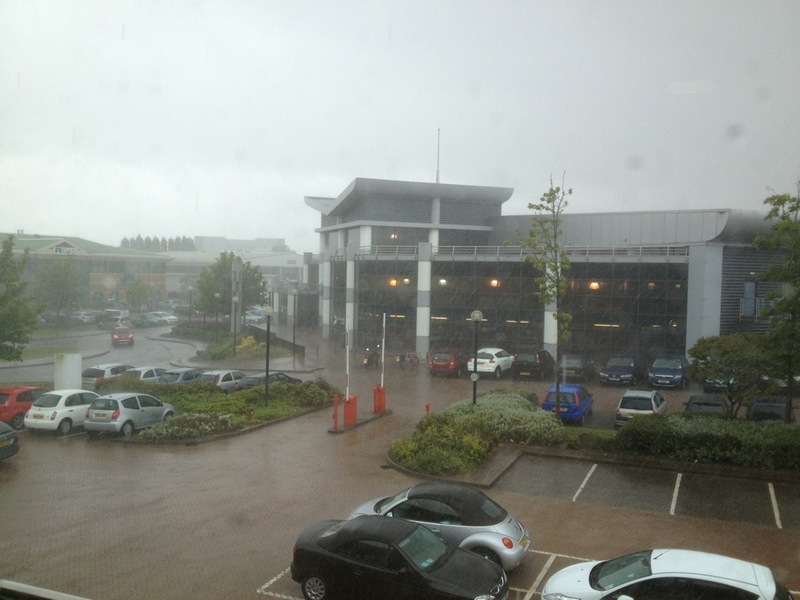 West Midlands Ambulance Service was called to Hermitage Way in Stourport on Severn shortly after 3pm this afternoon. Two ambulances, a rapid response vehicle, a paramedic area support officer, a senior paramedic ambulance officer and the Midlands Air Ambulance from Strensham were dispatched to the scene. “The pedestrian, a man, was treated at the scene for serious leg injuries. The man was given pain relief and fully immobilised before being airlifted to Queen Elizabeth Hospital Birmingham for further assessment and specialist treatment. If you missed the press release (issued on the 24th May) and to find out more about the yellow box on the wall at Lloyds TSB on Station Road in Codsall, come along to Parish Rooms on Church Road in the village between 9.00am and 12.30am on Saturday the 15th June. South Staffordshire First Responders and the Trust’s Community Response Manager Emma Wilkins will be running an informal drop-in session to give locals the opportunity to get hands-on with the defibrillator and learn how to save a life. Thursday 13th June 2013 – 5.15pm – Claire Brown. 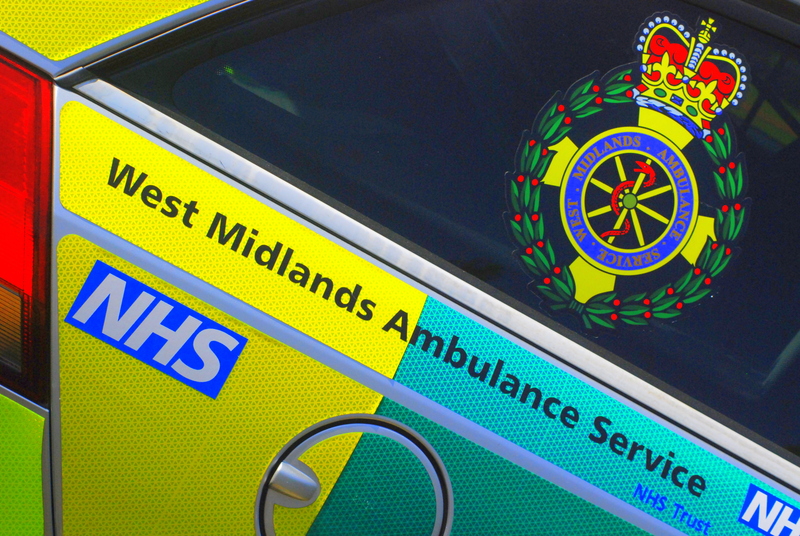 A girl is in a serious condition after being involved in a road traffic collision in the Black Country this afternoon. West Midlands Ambulance Service was called to the junction of Bilston Road, Moseley Road and Darlaston Lane at around 3.15pm today (Thursday). An ambulance, a paramedic area support officer and the Midlands Air Ambulance from Cosford with a MERIT trauma doctor on board attended the scene. A West Midlands Ambulance Service spokeswoman said: “When crews arrived they found a girl lying in the road with serious injuries being cared for by bystanders. “Crews and the medic began assessing the girl, believed to be 12 years old, and found she had sustained serious head, leg and pelvic injuries after reportedly being in collision with a car. “Pain relief was quickly administered to the girl to help stabilise her condition and make her more comfortable whilst they continued treating her injuries. 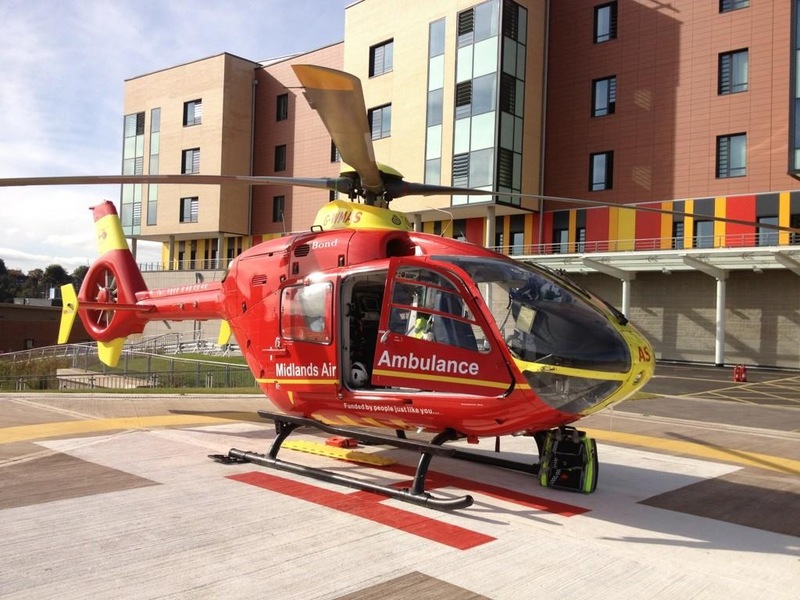 She was fully immobilised with a neck collar, spinal board and splints before the air ambulance transferred her to Birmingham Children’s Hospital. The medic travelled in the helicopter to continue treatment en route. Thursday 13th June 2013 – 3.00pm – Claire Brown. 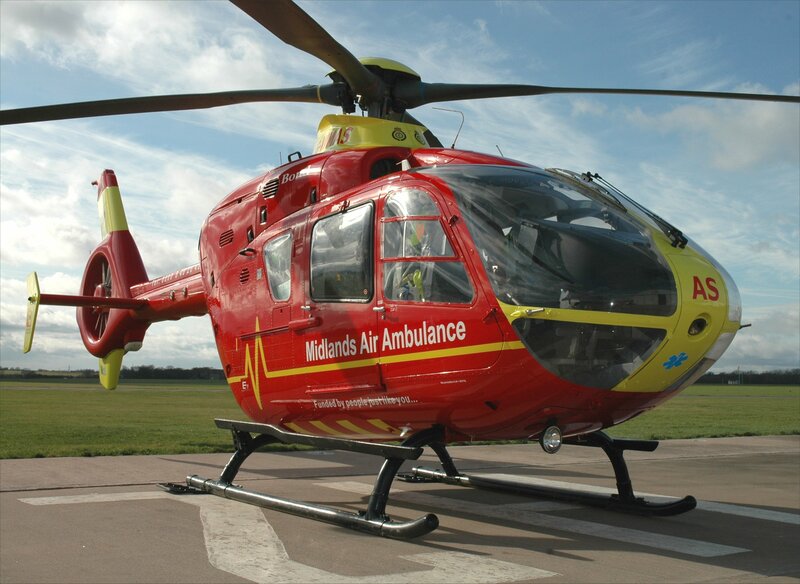 A man has been airlifted to hospital after falling from the roof of a property in Stourbridge. West Midlands Ambulance Service was called to a property off the B4186 Highpark Avenue in Wollaston shortly after 12.15pm this afternoon (Thursday). An ambulance, a paramedic area support officer and the Midlands Air Ambulance from Cosford with a MERIT trauma doctor on board attended the scene. A West Midlands Ambulance Service spokeswoman said: “Crews arrived to find a man who had reportedly fallen from the roof of a two storey building, landing onto concrete. “The man, believed to be in his 40s, was assessed by crews and the medic and was found to have suffered serious back pain and a suspected fractured wrist in the fall. They stabilised his condition on scene by administering pain relief to the man before they carefully immobilised him with a neck collar, spinal board and arm splint. We’re currently on the look-out for Business Administrative Apprentices, Emergency Medical Technicians &amp; Registered Paramedics. If you’re interested in working for West Midlands Ambulance Service along with around 4,300 other staff, and want to find out more about our current job opportunities, please visit http://www.jobs.nhs.uk/cgi-bin/advsearch?vpd_code=217. Thursday 13th June 2013 – 9.30am – Claire Brown. 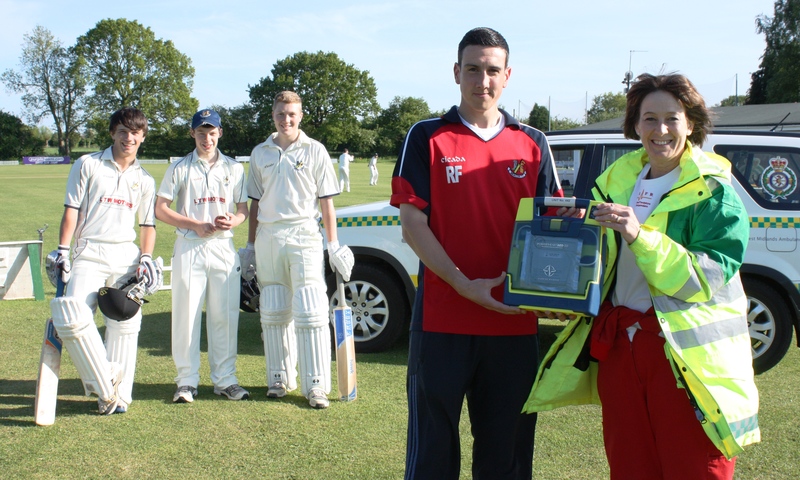 Cricketers in Wombourne are now equipped to help people in cardiac arrest thanks to the installation of a lifesaving box. Tucked away in the South Staffordshire countryside is Beacon Cricket Club on Trysull Road in Wombourne. With more than 100 members, young and old, and a busy calendar of coaching sessions, matches and county cricket games drawing in hundreds of spectators, the club is an ideal location for a defibrillator. 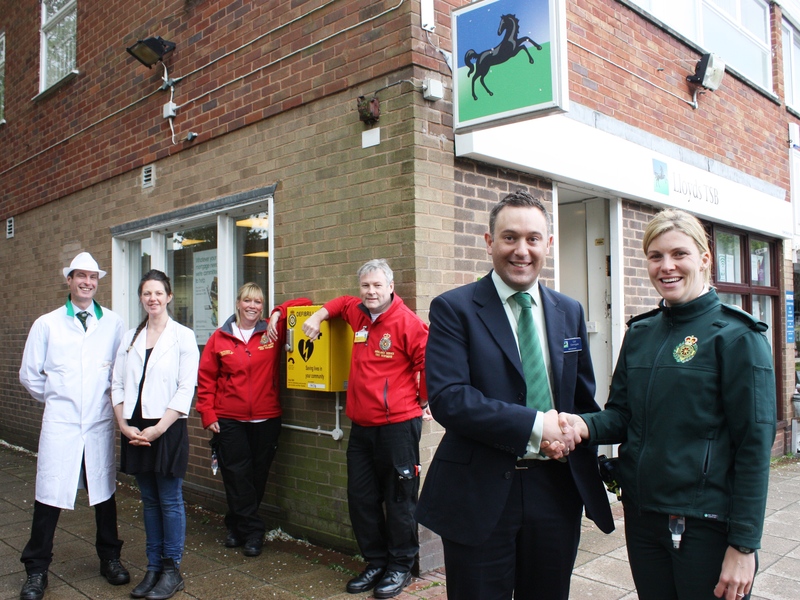 Last Tuesday (4th June) saw the club take delivery of an automated external defibrillator from the Trust; a device used to restart someone’s heart when they’re suffering a cardiac arrest. Sarah Hodgetts is a Senior Night Sister at Queen Elizabeth Hospital Birmingham. When she’s not at work, Sarah is a volunteer life saver with South Staffordshire First Responders and is also an advanced life support instructor. Sarah recently trained ten members of the cricket club in basic life support and the use of the defibrillator. She said: “The cricket club is off the beaten track, down a narrow country lane and because it’s in quite an isolated place it’s easy to miss it when you walk or drive past. Roger Siers, Chairman at Beacon Cricket Club, said: “Through our relationship with the local CFR group, we’re very pleased to have secured the custody of the defibrillator. Through this and the appropriate training we have received it is a comfort to know that in the event of us having a serious life threatening emergency then we have the training and equipment to deal with it, until the emergency services arrive, and hopefully save someone’s life. Pictured (left to right) – Cricketers Oliver Green, Harry Hodgetts and Jake Cartwright, 1st Team Captain Roger Fildes and SSFR Sarah Hodgetts. 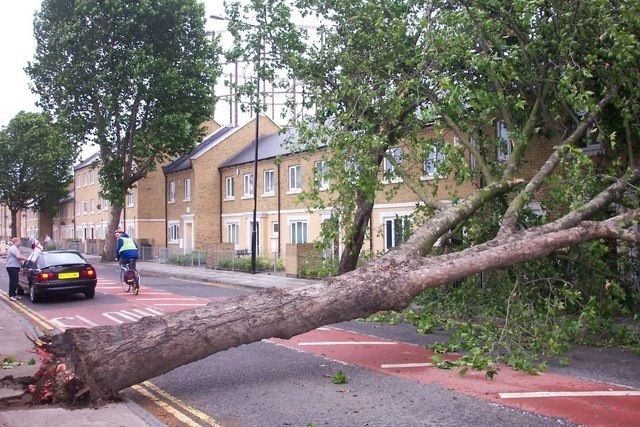 With the Met Office predicting gusts of 50mph tomorrow morning on your drive to work, please watch out for fallen trees and other debris. Wednesday 12th June 2013 – 1.30pm – Suzie Fothergill. West Midlands Ambulance Service’s Hazardous Area Response Team (HART) has recently installed a new training aid into their base to ensure they continue to be on top form. WMAS HART consists of 42 Paramedics that are trained in a variety of skills enabling them to provide lifesaving emergency medical treatment in some very difficult environments. 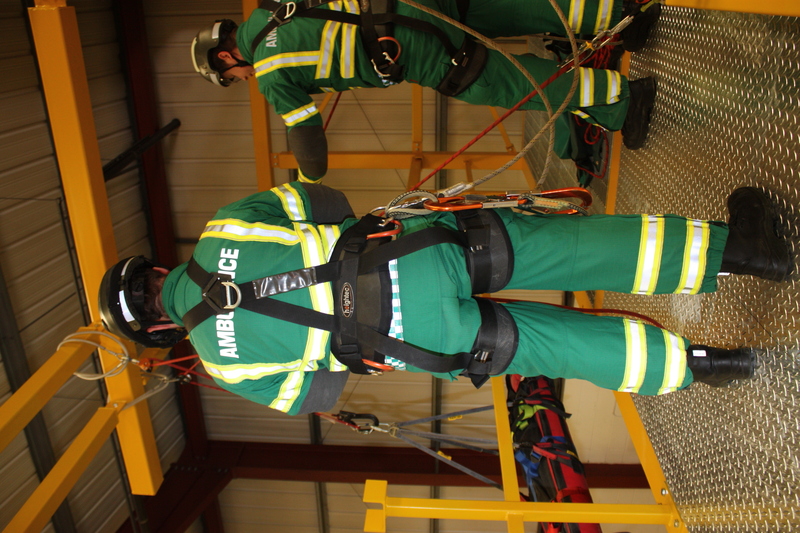 The teams are trained to use specialist equipment enabling them to work at heights, within confined spaces such as tunnels or collapsed buildings, rough terrain, at the scene of severe building fires as well as water rescue incidents. They also have specialist knowledge surrounding hazardous materials, such as chemicals, and how best to treat those patients that may have come into contact with such materials. 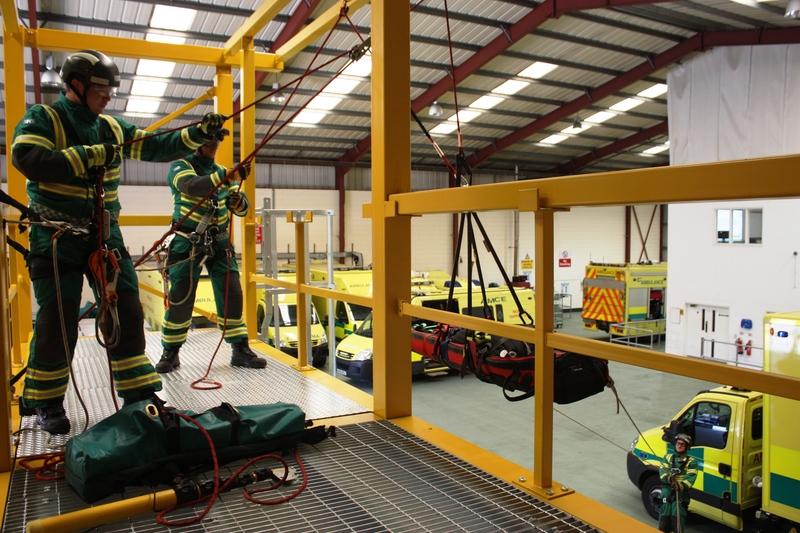 To help assist the team with some of their specialist ‘Safe Working at Height’ Training, a brand new purpose built structure standing seven metres high has recently been installed at their base in Oldbury. 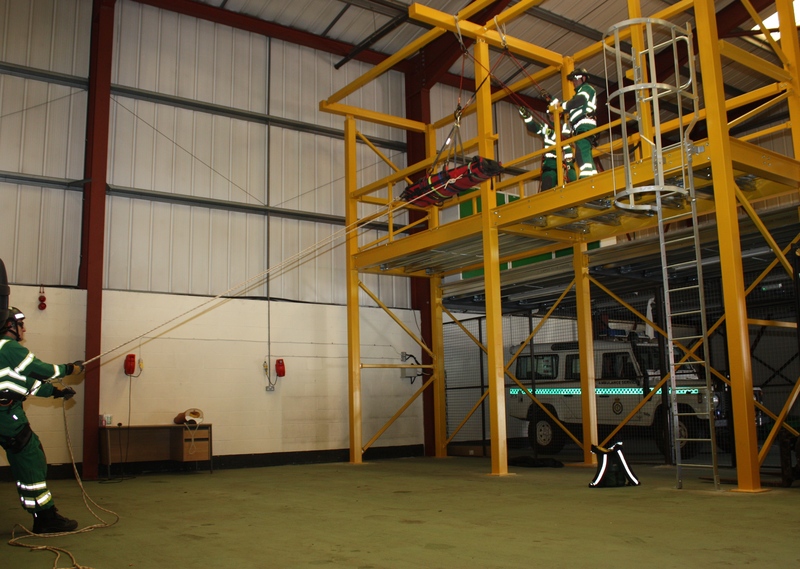 All HART operatives have to successfully pass a nationally recognised certificate in order for them to work at height. This certificate, which entails them undertaking and successfully passing an external two day course, officially lasts for three years. However, as the teams have so many specialist competencies West Midlands Ambulance Services provides protected training for each HART Paramedic every seven weeks. This refresher training ensures all HART Paramedics operate confidently and safely within all their competencies. Working within the scope of the Safe Working at Height competency, teams not only have to demonstrate their knowledge of how to help rescue patients from tricky locations but to also demonstrate the ability to carry out that work safely, using specific personal fall protection equipment, and to demonstrate the ability to rescue a colleague should anything unfortunate happen whilst at an incident. Ed Bowen, HART Paramedic and Urban Search and Rescue Lead said: “Having this facility on site is excellent. Teams no longer have to travel to use such facilities elsewhere, meaning they can train at times and dates that are best suited for them. Wednesday 12th June 2013 – 12.30pm – Steve Parry. A man has been airlifted to hospital after reportedly falling from a bridge onto the Wolverhampton ring road this morning. West Midlands Ambulance Service was called to the incident near the railway station at around 10.50am. An ambulance crew, a responder paramedic officer and the Midlands Air Ambulance from Cosford were sent to the scene. A West Midlands Ambulance Service spokesman said: “A man, believed to be in his thirties, had reportedly been injured after falling from a bridge. “The man received serious head, chest and pelvic injuries. 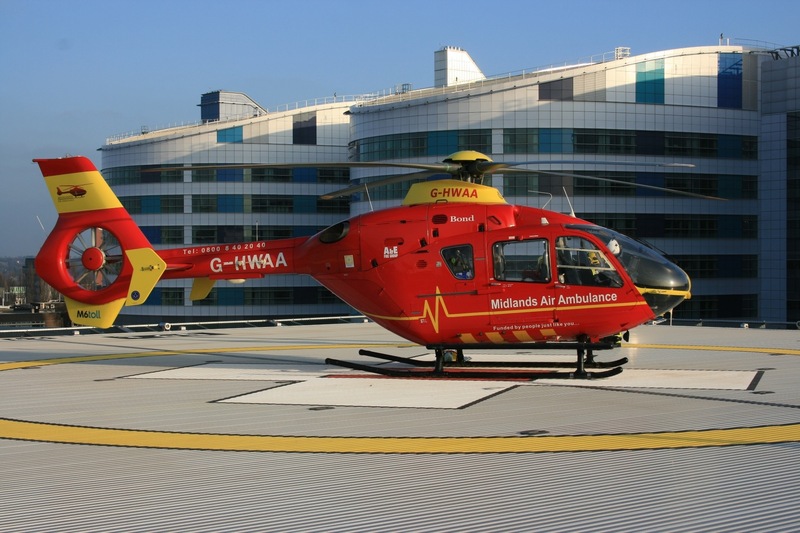 A doctor from the Midlands Air Ambulance anaesthetised the patient before he was immobilised fully with a neck collar and spinal board and airlifted to the Queen Elizabeth Hospital in Birmingham. 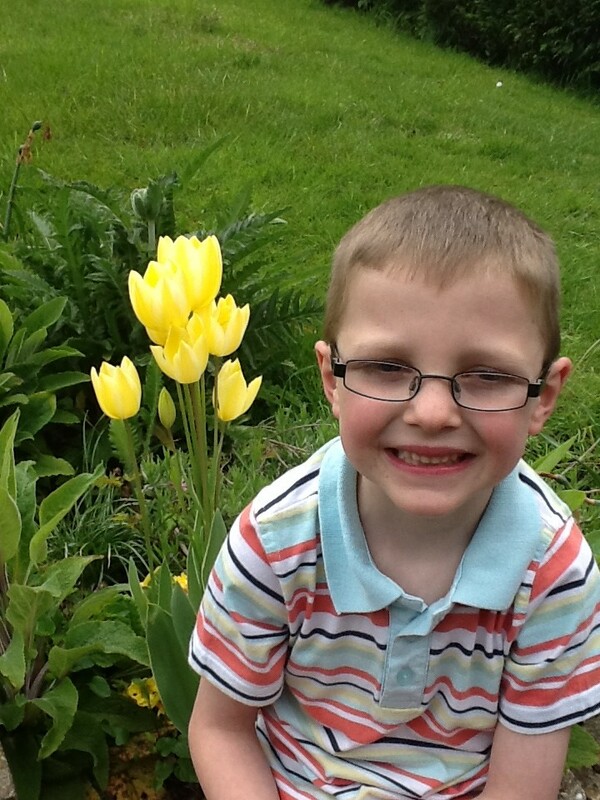 Wednesday 12th June 2013 – 11.26am – Murray MacGregor. An ambulance boss says it is a miracle that no-one was seriously hurt after a crash at a busy junction in North Warwickshire. The incident happened on the roundabout where the A5 from Dordon meets the slip roads off M42 at Junction 10. An off duty emergency care practitioner, an ambulance and a paramedic officer were sent to the scene after a number of 999 calls at 7.30am on Wednesday morning. Assistant Area Manager, Nigel Wells, said: “When crews arrived they found a small white van that had gone through some crash barriers and ended up back on the roundabout. “Two St Johns Ambulance first aiders who came across the incident were already on scene. “The van driver, a 47 year old Kingsbury man was suffering from a medical condition when we examined him. Thankfully, he appeared to have only suffered very minor injuries from the crash itself. “As a precaution has was cut free from the vehicle and was immobilised using a neck collar and spinal board before being taken to Good Hope Hospital for further assessment. Wednesday 12th June 2013 – 9.20am – Suzie Fothergill. A man has died following an incident in Walsall today. West Midlands Ambulance Service was called to a road traffic collision on Wednesbury Road shortly before 4.45am this morning. An ambulance, a rapid response vehicle, a paramedic area support officer, the Hazardous Area Response Team and the Trust’s MERIT rapid response vehicle, carrying a critical care paramedic and a trauma doctor were dispatched to the scene. The police and fire service were also in attendance. A West Midlands Ambulance Service spokeswoman said: “On arrival at the scene crews found a single vehicle that had left the carriageway and had come to rest on an embankment. Wednesday 12th June 2013 – 8.00am – Suzie Fothergill. A man has been taken to hospital following a road traffic collision in Birmingham today. West Midlands Ambulance Service was called to the incident on Islington Row Middleway at approximately 1.30am this morning. An ambulance, a paramedic area support officer and the Trust’s MERIT rapid response vehicle, carrying a critical care paramedic and a trauma doctor were dispatched to the scene. The police and the fire service were also in attendance. A West Midlands Ambulance Service spokeswoman said: “On arrival at the scene crews found a car that had been in collision with a lamppost. The vehicle had sustained significant damage. “The driver of the car, a man believed to be 19 years of age, was trapped in the vehicle for approximately one hour. The man, who was suffering from hip and back pain was fully immobilised and given pain relief before being extricated from the vehicle, with the assistance of the fire service. 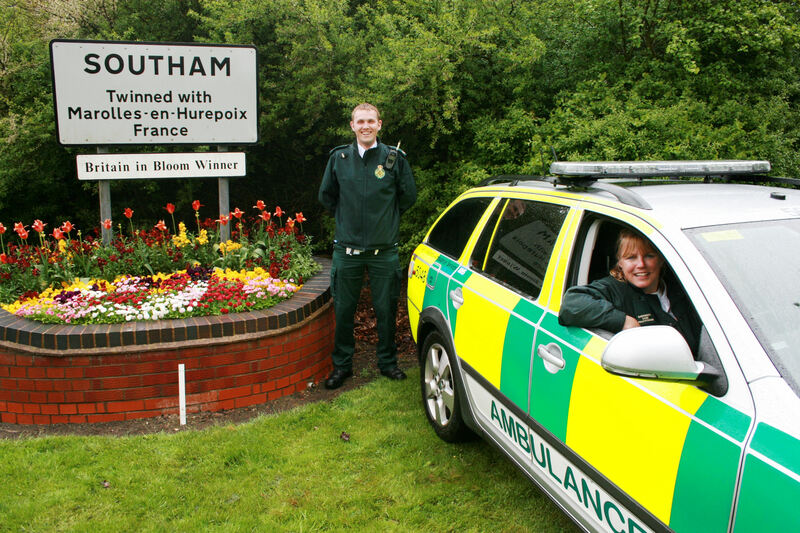 For the first time, Southam has its first ever dedicated team of paramedics at their own dedicated station. A Community Ambulance Station has opened within the town’s Warwick House Business Park with paramedics responding to 999 calls from there in the area since the 1st April, using a rapid response vehicle. 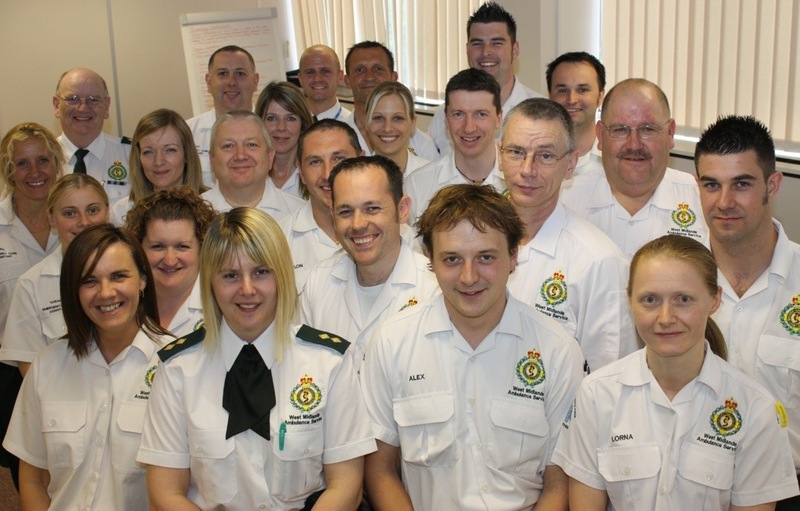 The team consists of three staff; two Emergency Care Practitioners (ECP) and an Advanced Paramedic. The ECPs both started their careers in nursing with one specialising as a Paediatric Nurse and the other having previously worked as a Practice Nurse in the town before joining the Ambulance Service. The third member of the team is an experienced Paramedic is currently completing extended training on patient assessment and wound Care. All three members of staff received additional training and gained extra skills (such as urine-testing) and treatment procedures (such as wound care) that traditionally would have meant taking the patient to A&E. They will increasingly be able to treat patients in the comfort of their own homes, or refer them for appropriate follow-up care without the need to take them to an acute hospital. Area Manager for Warwickshire, Martyn Scott, said: “The Community Paramedic Scheme is staffed twelve hours a day from the new community site based in Southam. It is hoped the team of paramedics with advanced training, will become integrated within the local Health Care Community, have referral pathways and work alongside other healthcare providers in the town and surrounding villages. In the first four weeks of the scheme going live, the paramedics attended 108 calls in the local area and also attended community events. 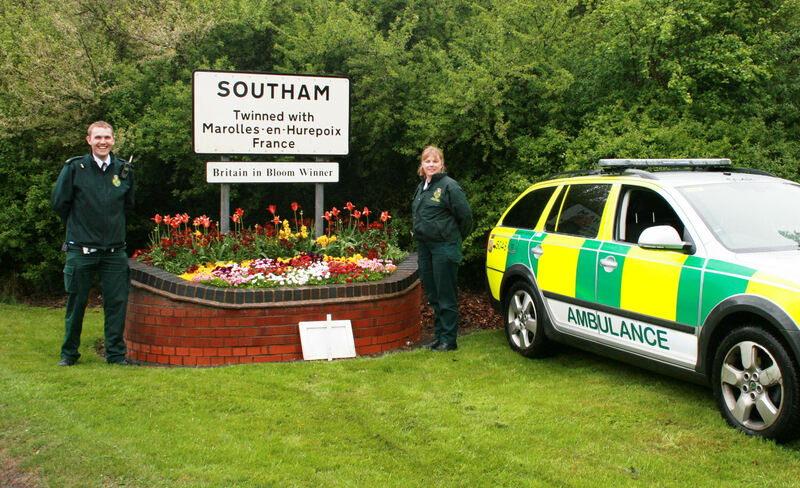 Martyn Scott said lastly: “Dedicated to Southam and the immediate surrounding area, the Community Paramedics are able to bring more A&E skills to the patient, instead of having to take patients to A&E. “The old image of the ambulance service many years ago was that all they did was take patients to hospital; that ambulances and its staff didn’t do much treating, just transporting. I am delighted that this has changed and the aim now is to ultimately reduce the number of people we take to A&E with paramedics treating things like minor wounds and cuts at home without having to take the patient to hospital. West Midlands Ambulance Service are also in the process of securing locations and setting up further Community Paramedic Schemes. Schemes will vary in hours of operation from 12-24 hours, 7 days a week. 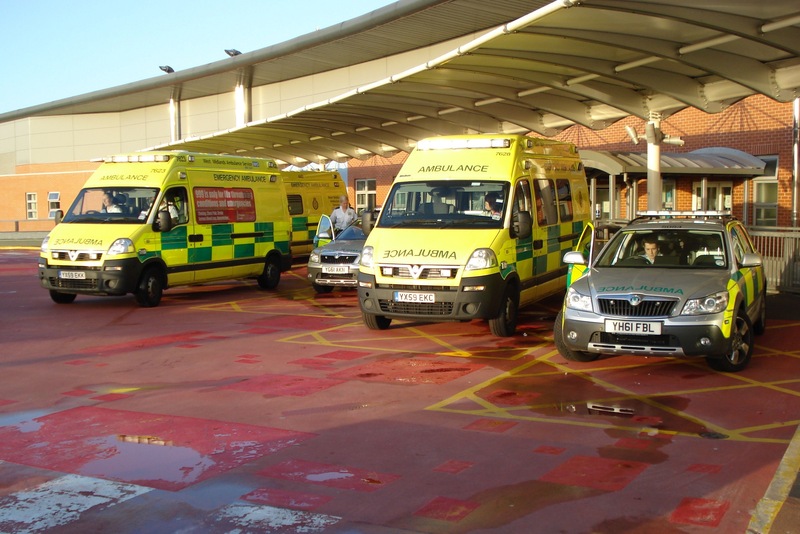 The move is part of West Midlands Ambulance Service’s ‘Make Ready’ Project. In addition to new teams of advanced paramedics, a new network of Community Ambulance Stations, such as schemes in Shipston-on-Stour, Kenilworth and Stratford-Upon-Avon are in the process of being set up. Two Ambulance Service Hubs will be opening in Coventry and Warwick in the next few months which will be brand new purpose built facilities which will ensure that ambulance staff will spend more time out on the road treating patients, than completing other tasks such as cleaning and restocking ambulances. These tasks will be done by other specialist teams of Ambulance Fleet Assistants. Area Manager Martyn Scott pictured with ECP Mandy Morrice.